All RÄUM products are designed to offer superior aesthetics, operate smoothly, and are also built to last. 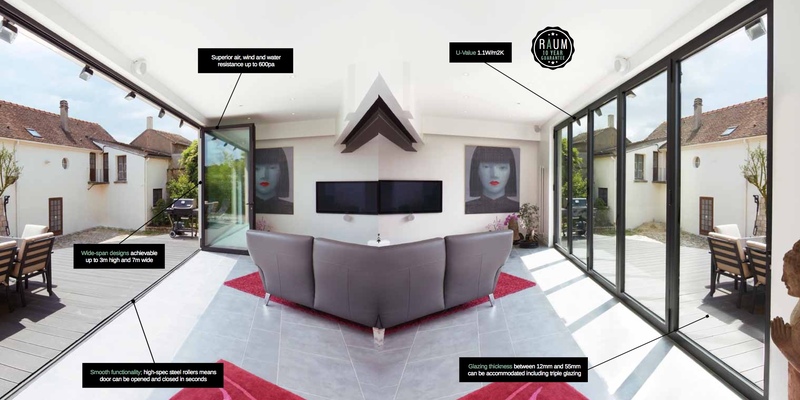 As such, RÄUM is positioned at the high-end of the door market, where there is high demand for systems which embrace innovation, luxury and performance. All RÄUM products come covered by our comprehensive 10-Year Manufacturing Guarantee – including locks, handles, profiles, laminates, and all other components used in the finnished product. Members of our RÄUM Registered Installer Scheme have been rigorously trained, assessed and vetted to give you complete peace of mind, and ensure your project is completed to the very highest standards. All of our registered installers carry the industry-approved MTC Skills Card. Your home and your family are the most precious things in life, so never compromise on security. RÄUM doors are designed with enhanced security features to keep out even the most determined intruders. All products have been rigorously tested and are Secured by Design accredited. RÄUM offers you a wide and diverse range of windows and doors that will provide structural integrity, weather performance, thermal enhancement and security. RÄUM windows and doors comply with and in many cases exceed current building regulations. U values as low as 1.1 depending on size, configuration and sealed unit performance. Our range of RÄUM aluminium doors will complement your home with striking panoramic views. The slim aluminium profiles are designed to give you a structurally sound product that will last for many years and requires minimal maintenance. All RÄUM aluminium windows and doors come covered by our comprehensive 10-Year Manufacturing Guarantee – including locks, handles, profiles, laminates, and all other components used in the finished product. There are literally hundreds of colours to choose from and you can have a different colour inside and out. You can choose between a matt or gloss finish, or opt for our special Coatex nish. You can even choose one of our realistic wood effect finishes if you prefer.